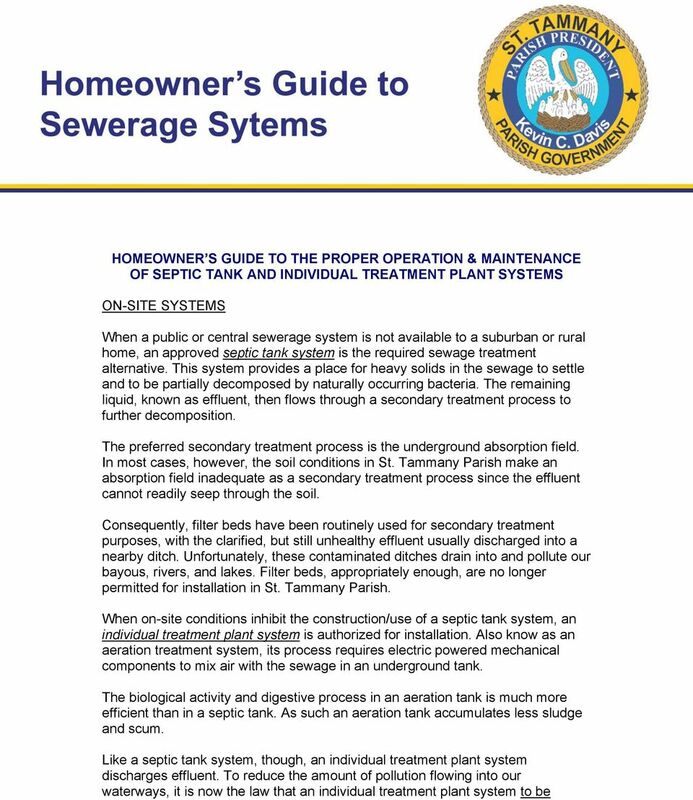 Download "HOMEOWNER S GUIDE TO THE PROPER OPERATION & MAINTENANCE OF SEPTIC TANK AND INDIVIDUAL TREATMENT PLANT SYSTEMS"
3 service call at least every six months, which includes inspection, adjustment, and servicing of the electrical and mechanical components. In time, some sludge will accumulate in the bottom of the settling compartment and will have to be removed. WHAT SHOULD I DO TO PROPERLY MAINTAIN MY TREATMENT SYSTEM? First and foremost, inspect your sewage treatment system once a year. If the sludge and surface scum combined are 1/3 the liquid depth of your septic tank, have the tank pumped out by a licensed sewage pumper. Products that claim to make the pumping or cleaning of septic tanks unnecessary should not be used nor considered as a substitute for proper maintenance. These products can cause the sludge and scum to clog the secondary system. Do not flush grease or other undigestible material such as cigarette butts and coffee grounds into the system. Minimize or eliminate the use of your garbage disposal unit which grinds up food wastes and places a burden on the treatment system. If you use a disposal unit, you may need to pump the solids from the tank every year. Use good quality toilet paper that breaks up easily when wet. Never flush paper towels, disposable diapers, newspapers, rags, and other items not normally considered sewage into the system. 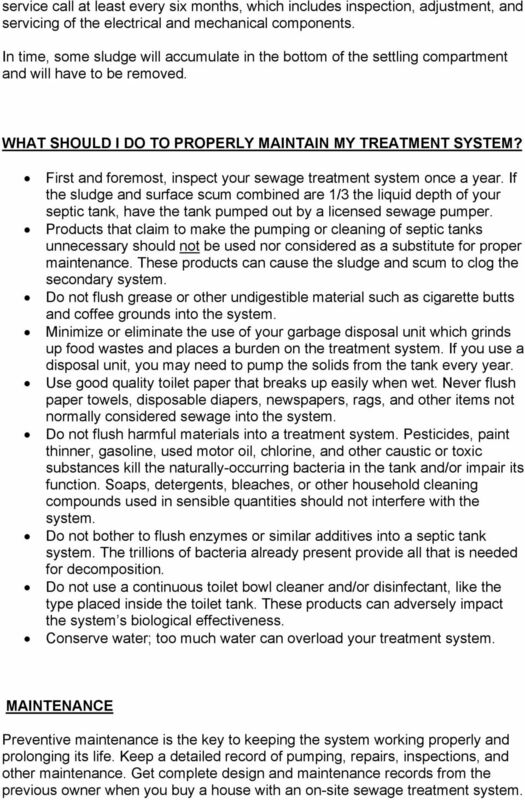 Do not flush harmful materials into a treatment system. Pesticides, paint thinner, gasoline, used motor oil, chlorine, and other caustic or toxic substances kill the naturally-occurring bacteria in the tank and/or impair its function. Soaps, detergents, bleaches, or other household cleaning compounds used in sensible quantities should not interfere with the system. Do not bother to flush enzymes or similar additives into a septic tank system. The trillions of bacteria already present provide all that is needed for decomposition. Do not use a continuous toilet bowl cleaner and/or disinfectant, like the type placed inside the toilet tank. These products can adversely impact the system s biological effectiveness. Conserve water; too much water can overload your treatment system. MAINTENANCE Preventive maintenance is the key to keeping the system working properly and prolonging its life. Keep a detailed record of pumping, repairs, inspections, and other maintenance. Get complete design and maintenance records from the previous owner when you buy a house with an on-site sewage treatment system. 4 Know the location of all components of your system. Make a sketch showing location and distances. Keep these records handy for future service visits. 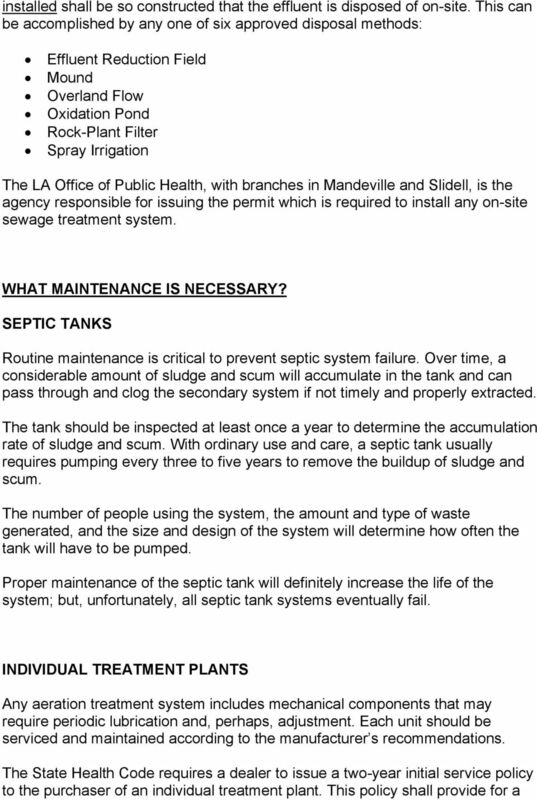 Sewage treatment systems generally offer little or no warning that they are about to fail. Take corrective action immediately if you notice any problems. Signs of a failing system: Sewage odors near the sewage treatment system or absorption field Sewage surfacing over the absorption field, especially after heavy rainfall Slow draining toilets and drains Plumbing backups or gurgling sounds in the plumbing Lush, green growth or wet or mushy ground over the absorption field Laboratory test results indicating the presence of bacteria in well water NONPOINT SOURCE POLLUTION An on-site sewage treatment system can provide suitable wastewater disposal only if it is adequately designed, carefully installed, properly operated, and sufficiently maintained. If yours is not, it is a source of pollution that poses a serious threat to public health and the vitality of our parish s waterways. 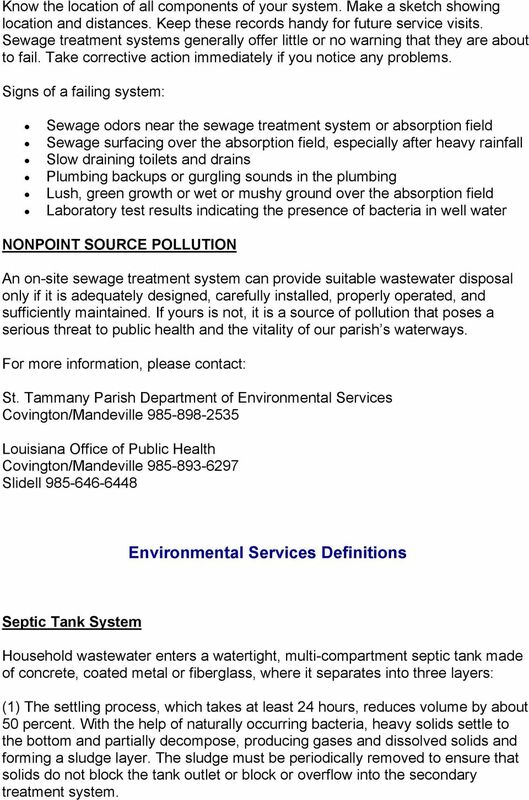 For more information, please contact: St. Tammany Parish Department of Environmental Services Covington/Mandeville Louisiana Office of Public Health Covington/Mandeville Slidell Environmental Services Definitions Septic Tank System Household wastewater enters a watertight, multi-compartment septic tank made of concrete, coated metal or fiberglass, where it separates into three layers: (1) The settling process, which takes at least 24 hours, reduces volume by about 50 percent. With the help of naturally occurring bacteria, heavy solids settle to the bottom and partially decompose, producing gases and dissolved solids and forming a sludge layer. The sludge must be periodically removed to ensure that solids do not block the tank outlet or block or overflow into the secondary treatment system. 5 (2) Grease and other light materials float to the top, forming a scum layer which is retained in the tank by vertical baffles. (3) The intermediate liquid layer, know as effluent, flows through an outlet to the absorption field, which is a series of parallel distribution pipes running through a bed of gravel. This allows partially treated liquid sewage to leak down through the gravel and soak into the soil. The soil filters out the remaining minute solids, which are digested by bacteria. Nutrients are absorbed by the roots of growing plants or slowly percolate to surface or ground waters. 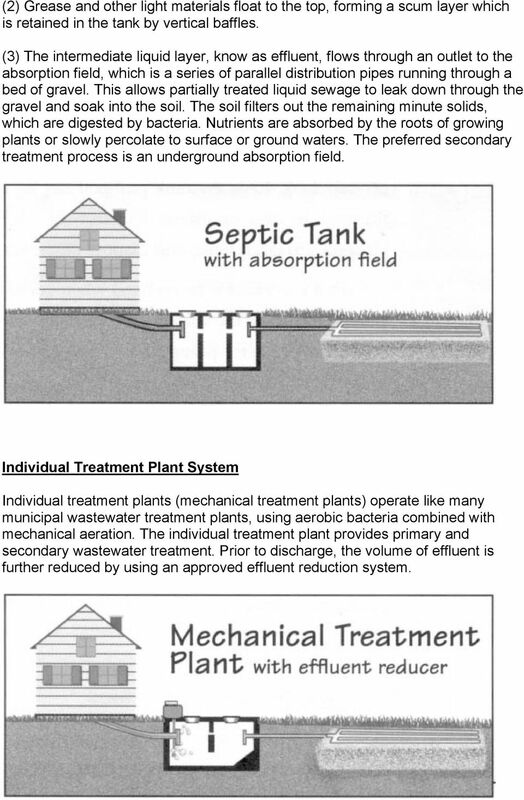 The preferred secondary treatment process is an underground absorption field. Individual Treatment Plant System Individual treatment plants (mechanical treatment plants) operate like many municipal wastewater treatment plants, using aerobic bacteria combined with mechanical aeration. The individual treatment plant provides primary and secondary wastewater treatment. Prior to discharge, the volume of effluent is further reduced by using an approved effluent reduction system. 7 Rock-Plant Filter system looks the same as a garden. The Rock-Plant Filter system requires a small amount of maintenance and should be treated the same as a garden. The Rock-Plant Filter system is three (3) feet wide and the length is determined by the size of the Individual Treatment Plant System (50 ft ft.). Spray Irrigation The Spray Irrigation system is a process of on-site disposal using pressurized dispersion of effluent through sprinkler heads. The effluent collects in a pumping chamber. At a predetermined level, a float switch activates a pump that forces the effluent through piping to pop-up or elevated rotating type sprinkler heads. Evaporation of the dispersed effluent prevents any runoff from occurring. The effluent must be adequately chlorinated prior to being dispersed. 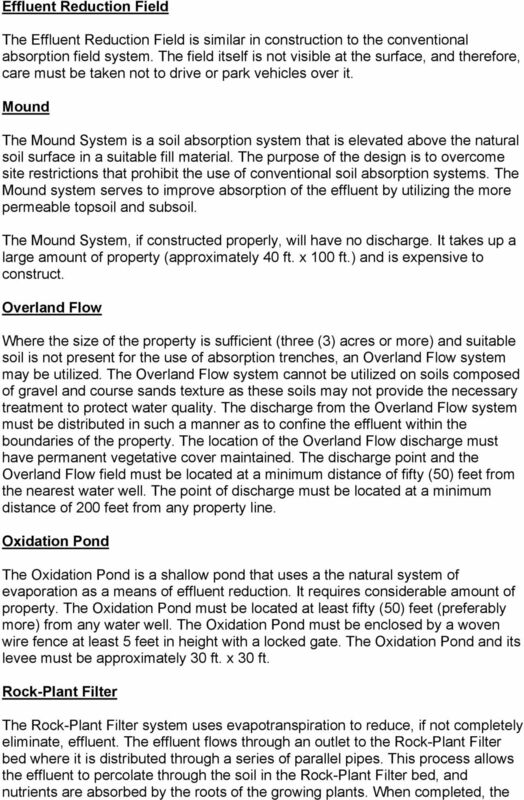 AEROBIC SEWAGE TREATMENT SYSTEM IIt s Your On-Siite System Operatiion and Maiintenance Guiide for Homeowners OKLAHOMA DEPARTMENT OF ENVIRONMENTAL QUALITY Environmental Complaints and Local Services P.O.